Bruce Charles Arians (born October 3, 1952) is an American football coach who is the current head coach of the Arizona Cardinals of the National Football League (NFL). He also served as the offensive coordinator and then interim head coach for the Indianapolis Colts during the 2012 season, when their head coach Chuck Pagano was diagnosed with leukemia. Arians guided the Colts to a 9–3 record over his tenure, which lasted from October 1 until Pagano's return on December 24. He has also been a head coach at the college level. Arians was the offensive coordinator of the Pittsburgh Steelers from 2007 to 2011 after being promoted from wide receivers coach, a position that he had held with the team since the 2004 season. For his 9–3 record as the 2012's Colts interim head coach, Arians was named 2012's AP Head Coach of the Year. Following the 2014 season, in which the Cardinals posted an 11–5 record, Arians was named 2014's AP Head Coach of the Year. A native of Paterson, New Jersey, Arians graduated from William Penn High School in York, Pennsylvania. Earlier, he attended York Catholic High School, where he was a standout scholastic quarterback. Arians attended and played college football at Virginia Tech. As a senior in 1974, Arians was the starting quarterback in a wishbone offense for the Hokies football team. That season he completed 53 of 118 passing attempts (44.9% completion pct.) for 952 yards with three passing touchdowns and seven interceptions. He rushed for 243 yards and eight touchdowns. Arians holds the Virginia Tech school record for most QB rushing touchdowns in a season with 11, two more than Michael Vick. He was also the first white player to share a dorm room with a black player in VT history. His roommate was James Barber, father of Ronde and Tiki Barber. Arians began his coaching career in 1975 as a graduate assistant at Virginia Tech. Arians then held an assistant coaching position at Mississippi State University (running backs and wide receivers) from 1978–80 before heading to the University of Alabama to coach the running backs from 1981–82 under Paul "Bear" Bryant. Arians was also the head coach at Temple University from 1983–88. While head coach for the Temple Owls, he compiled a 27-39 overall record over six seasons. All six of Temple's wins during the 1986 season were later forfeited; running back Paul Palmer, who was the runner-up in the Heisman Trophy voting in 1986, had signed with a sports agent before the season, making Palmer ineligible. Besides Palmer, other standout players Arians coached at Temple included cornerback Kevin Ross, safety Todd Bowles, offensive guard John Rienstra, and running back Todd McNair. Ross, Bowles, and McNair would all later serve as NFL assistant coaches with or under Arians. After coaching at Temple, Arians held positions with Mississippi State (offensive coordinator, 1993–95) and Alabama (offensive coordinator, 1997) in between NFL assistant coaching jobs. At the end of the college football season in 1988, Arians was hired in the NFL as a running backs coach for the Kansas City Chiefs. It was during this time with the Chiefs that he worked with the coach who brought him to the Pittsburgh Steelers, Bill Cowher. He also spent one season as the tight ends coach of the New Orleans Saints in 1996. Following this stint was when he made a name for himself when he got the job as the quarterbacks coach of the Indianapolis Colts in 1998. He was the first quarterback coach of Peyton Manning when he arrived in the NFL. Afterward, he was hired as offensive coordinator (2001–2003) for the Cleveland Browns under Butch Davis. In 2002, he helped the Browns finish 9–7 (2nd in the newly aligned AFC North) and to a wild card playoff berth where they lost to the Steelers (36–33) in the first round. It was during his tenure with the Browns that he first worked with Chuck Pagano who served as the Browns secondary coach from 2001 to 2004. After the 2003 season, he was hired as the Steelers wide receivers coach and in 2007 was promoted to offensive coordinator of the Steelers, a position he held until his contract expired after the 2011 season. On January 28, 2012, Arians agreed to become the offensive coordinator of the Indianapolis Colts, replacing Clyde Christensen. On October 1, 2012, Arians was named the interim head coach of the Colts following coach Chuck Pagano's leukemia diagnosis. Arians led the Colts to a 9–3 record, part of one of the biggest one-season turnarounds in NFL history. The nine wins are the most by an interim head coach in NFL history. After winning only two games in 2011, the Colts returned to the playoffs. Pagano returned to the Colts as head coach on December 24, 2012, with Arians returning to his role as offensive coordinator. Arians missed the Colts wild-card game loss against the Baltimore Ravens due to being hospitalized with an illness, which was described by doctors as an inner ear infection or a virus; Arians had missed practice on January 3 due to the flu. Arians was named the 2012 AP Coach of the Year, making him the first interim head coach to win the award. On January 17, 2013, the Arizona Cardinals and Arians agreed on a 4-year deal that would make Arians their head coach. Arians is the first Cardinals coach since Norm Barry back in 1925 to record at least nine wins in his first season, with a record of 10-6 for 2013. The Cardinals finished the 2014 season with an 11-5 record and were the #5 seed in the NFC. The 11 wins tied a Cardinals franchise record for most wins in a season. Arians led the Cardinals to a 9-1 start, best in the NFL, but injuries to starter Carson Palmer (who was 6-0 as starter) and backup Drew Stanton, (who was 5-3 as starter) led to the Seattle Seahawks claiming the divisional title with a 12-4 record. The injury plagued Cardinals were eliminated by the Carolina Panthers in the first round of the NFL 2015 playoffs, 27-16. Following the season, Arians was named AP Head Coach of the Year for the second time in three seasons. On February 23, 2015, the Cardinals announced a new 4-year deal with Arians which will keep him with the Cardinals through the 2018 season. After starting 3-0 like the previous season In 2015, Arians led the Cardinals to a franchise record in season wins, ending the season with a 13-3 record. The Cardinals defeated the Green Bay Packers in the Divisional Playoffs, Arians' first playoff win as a head coach. The next Sunday, in the NFC Championship, the Cardinals were defeated again by the Carolina Panthers, in a 49-15 blowout. Arians is a prostate cancer survivor. He and his wife Christine have a son, Jake (born January 26, 1978), who spent part of the 2001 season as the placekicker for the Buffalo Bills, and a daughter, Kristi Anne (born December 15, 1980). * 1986 team was 6–5 on the field, but had to vacate their wins due to the presence of an ineligible player on their roster. ↑ Cannizzaro, Mark. "CARTHON & MUIR RECEIVE INVITES TO STAY ABOARD", New York Post, January 20, 2001. Accessed May 3, 2015. "One of the offensive coordinators who's believed to be at or near the top of Edwards' list is Colts' quarterbacks coach Bruce Arians, a Paterson, NJ, native who's had a close hand in the development of Peyton Manning." ↑ McClure, Jim (2011-02-06). "York County, Pa.'s steel and green links to the Super Bowl". York Town Square. York Newspaper Company. Retrieved 2011-04-30. ↑ McClure, Jim (2009-02-05). "Names of stars from York County with pro sports links just keep increasing". York Town Square. York Newspaper Company. Retrieved 2011-04-30. ↑ "Virginia Tech records and history" (PDF). Retrieved 2007-05-01. ↑ Dulac, Gerry (2012-01-20). "Steelers' Arians retires from coaching". Pittsburgh Post-Gazette. Retrieved 2012-01-20. ↑ Schefter, Adam (2012-01-28). "Former Steelers OC Bruce Arians has agreed to become the Colts new OC. He's flying to Indianapolis on Monday to review and sign contract.". Twitter. Retrieved 2012-01-28. ↑ "Colts coach Chuck Pagano has 'serious illness,' will likely miss several games". Retrieved 2012-10-01. 1 2 Associated Press (2013-01-03). "Bears get permission to talk with Bruce Arians". The York Dispatch. Retrieved 2013-01-03. ↑ Martin, Jill (December 24, 2012). "Colts coach Pagano back on the job after leukemia treatment". CNN. ↑ Rosenthal, Gregg (2013-01-06). "Bruce Arians in hospital, won't coach Indianapolis Colts". National Football League. Retrieved 2013-01-06. ↑ Milner, Barry (2013-02-02). "Colts interim coach Arians wins top honors". Yahoo! Sports. Archived from the original on February 13, 2013. Retrieved 2013-02-02. ↑ Baum, Bob (2013-01-17). "Cardinals hire Bruce Arians as head coach". Yahoo! Sports. Retrieved 2013-01-17. ↑ "Arizona Cardinals in Good Hands with Head Coach Bruce Arians". 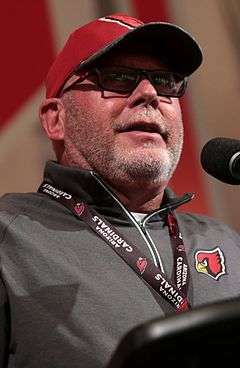 ↑ "Arizona Cardinals' Bruce Arians wins Coach of the Year". ↑ "Bruce Arians, GM get 4-year deals". ESPN. Retrieved 23 February 2015.